Chandigarh Administration, Department of Higher Education is going to conduct written test for the posts of Clerk, LDC, Steno typists. The written exam is scheduled to be held on 05 June 2016. Earlier Chd Admin, Higher Education department had completed the process of getting applications for these 329 posts. For appearing in this test, aspirants have to download the admit card from here. The latest news is that the Admit card of Chandigarh Administration Clerk, LDC, Steno typist exam are available now. Those candidates who had applied, can download Chandigarh Administration Clerk, LDC, Steno typist Exam Admit card from below. Chandigarh Administration is going to conduct written exam on 05 June 2016 for Clerk, LDC, Steno typist posts. For that, admit card are going to be available from 21.05.2016. Candidates have to download Chandigarh Administration admit cards from the official website sssc.gov.in via the direct link given below. The test will be held at various centres in Chandigarh. All the important details like exam venue, roll number, date and time etc. had been mentioned in them. Earlier Chandigarh Administration, Department of Higher Education had invited online applications for Clerk, LDC, Steno typist posts through C-DAC Mohali. Graduate eligible candidates have applied for these posts through recruitment-portal.in website. Now the written test date and admit card release date had been declared. The written examination is of 200 marks and consists of two objective type papers. The time duration will be 2 hour. There will also be a stenography test for steno typist posts of qualifying nature. General Knowledge -- 40 marks answer. Negative marking: 0.25 for each incorrect answer. Candidate should obtain at least qualifying 40% marks in each paper i.e. 40 out of 100. The candidates can download their admit card from Recruitment Portal Chandigarh Administration website sssc.gov.in from here. 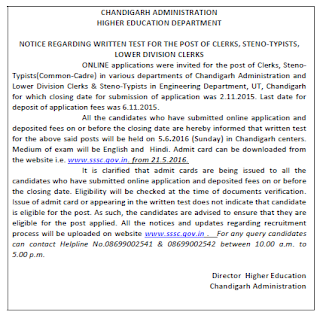 In order to download the admit card for Chandigarh Administration Clerk, LDC, Steno typist exam, candidates need to visit the direct link provided here (after release). It will take you directly to download page. Then candidates need to enter their reg. details and click submit. Their Chandigarh Administration admit card 2016 will be shown and candidates should take a print. This admit card should be brought by the candidate on the exam date at the test centre as without it, they will not be given entry.